This 2-time Tony® and Drama Desk Award-winning treat is packed with nonstop laughs. In, "The 39 Steps" a man with a boring life meets a woman with a thick accent who says she is a spy. When he takes her home she is murdered. 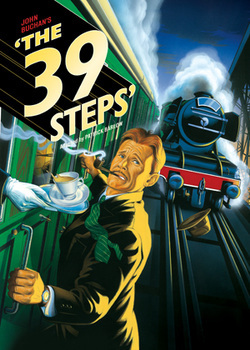 Soon after a mysterious organization called "The 39 Steps" is hot on his trail and we follow the incredible adventure of our handsome hero, Richard Hannay, as he encounters dastardly murders, double-crossing secret agents, devastatingly beautiful women and, of course it all climaxes in a death-defying finale!